On 23 September 2018, the Japan Aerospace Exploration Agency (JAXA) launched the HTV7 or "Kounotori7". This Kounotori flight was planned to test the HTV Small Re-entry Capsule (HSRC). For this technical demonstration, protein crystals grown in ISS were planned to be placed inside. The protein samples were kindly provided by the researchers from universities and institutes in Japan. The PCG experiment on the International Space Station (ISS) was conducted at 4°C, and on November 6, 2018, the crystallization containers were placed into the HSRC. Following the recovery on Earth, they were transported to the JAXA Tsukuba Space Center (TKSC) on November 13, 2018. 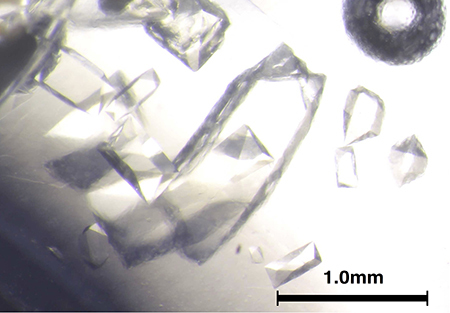 The sample conditions were inspected at TKSC, and no damage to the crystals was observed. The temperature data show that the required temperature (~4°C) was maintained throughout the recovery. This result indicates the HSRC can be a useful means for recovering temperature sensitive materials such as protein samples from the ISS. Some crystals are presented below. Fig.1 shows a crystal of hematopoietic prostaglandin D synthase (HPGDS), an enzyme synthesizing prostaglandin D synthase 2 (PGD2). Dr. Kosuke Aritake, professor of Daiichi University of Pharmacy and his colleges will identify its precise structure to develop drugs for muscular dystrophy and other diseases. Fig. 2 shows large crystals of cellulase (a cellulose-degrading enzyme) called PcCel45A produced by fungi. Cellulose is a main component of a plant cell wall. A technology development for efficient biomass transformation into useful materials is expected. Dr. Kiyohiko Igarashi, associate professor at the Graduate School of Agricultural and Life Sciences (Faculty of Agriculture, The University of Tokyo, UT), and Ms. Kaori Matsuyama, Ph.D. student of UT have a plan to conduct neutron diffraction experiments with these crystals of more than 1 mm3 grown in space. They will be the first Japanese group to conduct a neutron diffraction experiment on crystals grown in space. They wish to collect high-quality data from them and analyze them successfully. 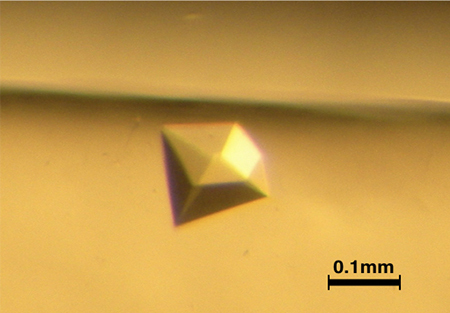 JAXA will utilize the results for future research to produce large protein crystals in space. The protein crystals have been handed over to the researchers. These samples will be analyzed at research facilities including Spring-8, Photon Factory and J-PARC.